The Just Us Brothers are still at it in Placer County. Their efforts to take their franchise of pay-to-play graft and corruption statewide have failed but the hubris of these guys has no limits or shame. While Impact Republicans of California has failed to catch on as a player in statewide Republican circles and is not even registered as a paper tiger with the California Republican Party, they are still playing in their own backyard. They are mercenaries for hire and still do the bidding and dirty work of folks like the Placer County Mafia. Work for which they are well compensated. They are like a hydra but not in the traditional sense. This hydra has a hive mind but many tentacles. Every two year election cycle they grow another appendage while doing the same dirty tricks and off the book operations but under a different name. Like a deep cover agent that assumes a new identity each time their cover is blown, these guys just keep at it by reinventing new names for themselves. Their latest incarnation is operating as Placer County Impact Republicans Political Action Committee. Their self-described purpose is “Contributions or expenditures to support or oppose candidates or measures in Placer County”. What we learned from the second Star Wars trilogy is that always there are two. With George and Aaron Park, always there are three. In this case the token “red shirt” along for the ride is Kirk Uhler. Uhler is the public face of this cabal of corruption in Placer County. From what I have seen, he certainly could not be called the brains of the operation. The Just Us Brothers—well they are the muscle. 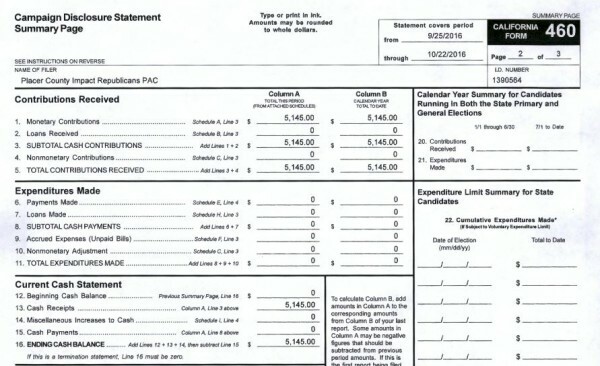 For undocumented services rendered, the Placer County Impact Republicans PAC have been awarded $26,000 by the League of Placer County Taxpayers PAC. My sources in Placer County say that the money is from Pro Measure M contributions. So I asked myself, who is the League of Placer County Taxpayers? Well they are not the Placer County Taxpayers Association; however, I think their name is intended to mislead people into confusing them with the Placer Taxpayer Association. I did a web search on these groups. Wow, was I in for a surprise. Most of what I’m about to report can be found at this link. As I began to research the League, I found a trail that lead to two records with the California Secretary of State’s Office. Both listings for the League of Placer County Taxpayers are inactive. After seeing that the second and more recent group had a status of FTB Suspended, I looked that up on the Secretary of State website. Please note that the League had its license suspended due to not filing proper tax documents. Thus no active California Corporation called the League of Placer County Taxpayers is recognized by the Secretary of State. 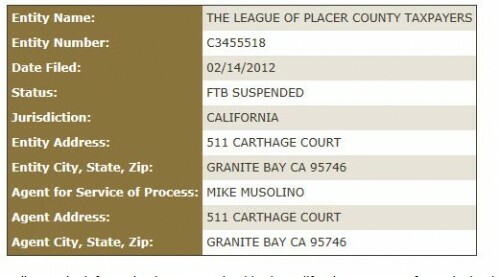 Mike Musolino’s name however did continue to appear in filings with the Secretary of State for campaign expenditures for the League of Placer County Taxpayers thru 2015. The only active Internet search result is a Facebook page for the group. It has five posts since it was created. The first is a shared post that Tom McClintock wrote in 2013. Miraculously, the Facebook page appeared beginning a week ago. Then my search got more interesting. Guess who the Treasurer is for the League of Placer County Taxpayers PAC. Yes, George Park. 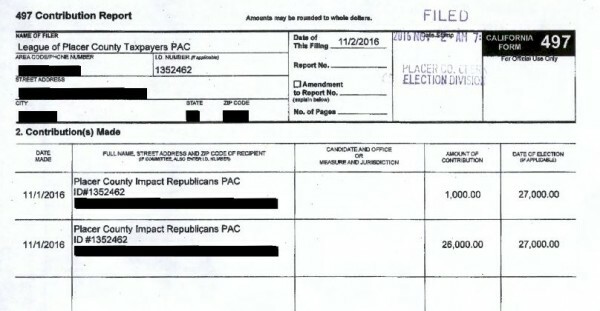 So Park wrote himself a check for $26,000 from the League of Placer County Taxpayers PAC to Placer County Impact Republicans PAC. 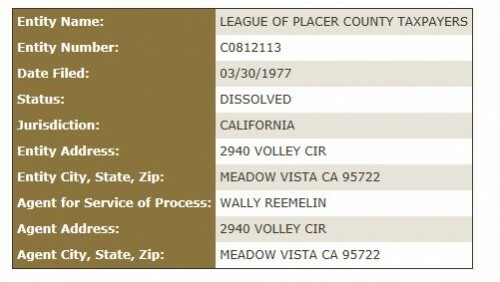 January 2016 filing showing George Park as Treasurer of the League of Placer County Taxpayers. Yes, in case you were wondering, Park is still the Treasurer of both groups. Look at the October 2016 Form 460 filings for both groups. Since my sources contacted me, The Just Us Brothers got another grand. The only other contribution on file to Placer County Impact Republicans PAC is this one from Committee for Home Ownership of the North State BIA. Please note that as of the filing with the Secretary of State on 10-22-2016, Placer County Impact Republicans PAC is reporting zero expenses. Due to the closeness of the election most expenditures are required by election law to be reported within 24 hours. With less than three days to go before the election, Impact Republicans takes in $26K in last minute contributions and has spent none of it? Again is it payment for off the books services rendered? A reasonable person might come to this conclusion. Literally, as I was doing a final edit for this blog, a new document was posted for the Impact PAC. However, it begs more questions than it answers. Above is the October 22, 2016 filing showing that Impact Republicans of Placer County PAC has $5,145 for their cash balance. Late filing report posted online after 11 AM Saturday November 5th. The $26,000 income they got is then reported as being November 1, 2016. So they purposely wrote two hot checks a week before they received enough money to cover the expense? Seeing this timeline, thoughts of “pay-to-play” and “coordination of campaigns” leap into my fertile imagination. Is it my accounting background or does this look fishy to you? The Parks have a long history of purposely not keeping any sort of detailed paper trail of their forays into the political arena. It will be interesting to see where the rest of the funds reportedly end up. 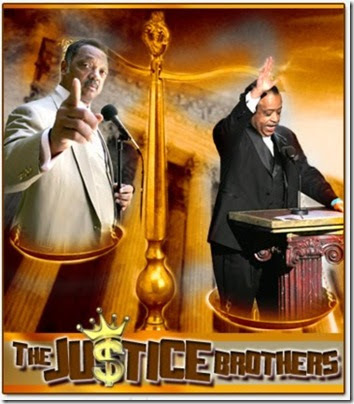 Are the Just Us Brothers the conduit or the destination? Somehow I think that answer will stay hidden until after November 8th.